With Orb you can play all your music on any stereo in your home. Select Your Music Using your iPhone, iPod touch, iPad, or Android device as a remote control, Orb lets you browse your entire music collection, as well as your favorite Pandora, Sirius, and Internet radio stations. Pick Your Stereo Orb streams your music to any stereo connected to your Orb music player. Put a player in each room and start amazing people with your DJ capabilities! All you need is an Orb connected to your stereo. Orb MP-1 works with your home computer, smart phone, and wi-fi network to stream music from your music collection (e.g. iTunes library) or internet music services (e.g. 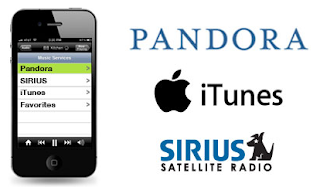 Sirius Radio). 1.Orb Caster is powerful media server software that runs on your PC or Mac. 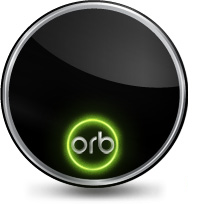 Orb Caster indexes all the media files on your PC or network drives and streams the media to your Orb device. 2.Orb Controller is an app for your iPhone or Android* smart phone that lets you control your music from anywhere in your home. Use the easy touch interface to choose your music, playlist or internet radio station, and the Orb device you want it to play on. 3.Wi-Fi Network is how Orb devices connect to your PC/Mac, smart phone, and speakers in your home. 4.Orb music players connect to any stereo, boom box, or powered speakers with a line-in. We have many gadgets in our home that collectively store our extensive collection (growing daily) of digital music. Between the kid's MP3 player's, our iPod's, phones, laptops, and desktop...we have amassed a somewhat intimidating library of digital music! How to get those specific tunes we want in one place when we want to listen to them? That's a task that we hadn't yet mastered...until we took the Orb for a spin recently. This handy little circular device that is smaller than a ...dare I say it? CD (I know I'm sounding super old, huh?) can transmit our music and online music content directly to the device of our choice, simply by connecting the Orb Music (Wi-Fi connection and setup necessary). Setup is fast and simple.... and the result is Music. Sweet Music. WITHOUT BOUNDS! 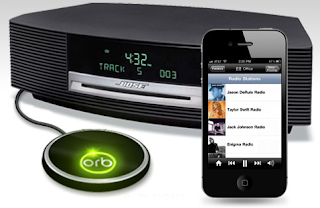 Suprise the Digital Music Fanatic in your life this Father's Day with an Orb ..... and set their music free! Where would you love to put an Orb Music in your home? The Comment is considered your entry. I would love it in my craft/sewing room! I would keep this in my family room! I'm a public follower and I would put the Orb in my kitchen. We spend so much time there. I'd love to put this in my office. I'd love this in my kitchen!